The Friends of Metro Parks were met with bright blue skies, brilliant sunshine, and the first taste of spring for a Friends Only hike at Chestnut Ridge Metro Park. Naturalist Greg Wittman gave a quick overview of the “end of winter” hike we were about to embark on, and 32 Friends took off up the ridge. One of the most exciting parts of a Friends of Metro Parks membership is the access to some exclusive opportunities. Chestnut Ridge is open to the public every day, but it’s not every day that there is a guided hike with a naturalist to provide insight into the history and ecology of the park, and it’s not every day that you get access to some of the parks lesser-known features. The Friends filed down, off-trail, to an old sandstone quarry, that normally remains unnoticed from the regular trails vantage point. Greg Wittman, the Naturalist guiding our hike, called attention to the iron deposits within the sandstone, and told us about the time when he followed the path of a bobcat into the quarry, through thorns and over rocks and to eventually find more evidence that a big animal had definitely been in the area recently. We scrambled out of the quarry, one by one, and continued up the hill to the “concrete henge” of Chestnut Ridge, where a water tower used to sit back when the land was used as an apple orchard. Onward up the hill, we came to a clearing where the farmhouse stood, but all that was left was a brick foundation and traces of the life that was once lived there. Looking out over the fresh sprouts of what would soon be daffodils was that iconic “Chestnut Ridge” picture. Beautiful, even at the very end of winter, with the promise of spring just a few weeks away. We ended this hike at the docks overlooking the pond, invigorated by the crisp end-of-winter air, warmed by the spring sunshine, and excited for what the Friends have in store for the rest of the year. The gray and dull skies of January and February in Ohio were hardly felt when the Metro Parks winter hikes began. Bundling up, putting on two pair of socks, and waiting in line for soup to warm the bones was something to look forward to each weekend. This year was especially eventful with hikes during snow, rain, and ice. There were even warm days where a coat was not needed! The Columbus community gathered to celebrate fitness and nature - many with their dogs, and babies begin pulled in sleds or in backpacks. Each person has their favorite park, whether it be because of location, wildlife, or the trails themselves. The Sharon Woods hike was just beautiful this year. Snow started falling shortly after the start time, creating a magical winter wonderland for hikers of all ages. Not all hikers were able to make the weekend dates, like me and my trail buddy. We are determined to get a walking stick, though, and will be making up the parks we missed during March. We will be chasing down the rangers for our hole punches! If you have not attended a hike during the Metro Parks Winter Hike Series, make 2020 your year. Seriously, get out in the fresh air even if it is cold and snowy. This is your reason to be outside during the cold months, besides shoveling the driveway. Fresh air and physical activity is vital to health: both emotional and physical. Plus, it is a great activity to get family and friends together. On January 20th, Friends members and Metro Parks volunteers braved the cold to attend the third annual State of the Metro Parks event at the new Eagleview Lodge at the Blacklick Woods Golf Course. Speakers included Metro Parks Director Tim Moloney and Friends of Metro Parks President Aryeh Alex, who recapped the last year at Metro Parks with a highlight on our Issue 3 levy campaign that passed with 63.7% of the votes in Franklin County, keeping the Metro Parks funded for an additional 10 years. Friends of Metro Parks board member Rita Volpi led a discussion focused on levy promises and looking forward, and Tim Skinner, Friends of Metro Parks Vice President, presented the Metro Parks volunteer of the year awards. Of those volunteers, one was awarded the overall Metro Parks volunteer of the year award. The awards winners from each park are listed below. The Friends of Columbus and Franklin County Metro Parks would like to express our gratitude to everyone who helped to support our efforts in 2018. Our volunteers and Friends of Metro Parks Members help to make our Metro Parks extraordinary! The Friends of Metro Parks kicked off their Passport to Metro Parks program on Saturday, June 16th at Sharon Woods Metro Park. This grant-funded program was developed by the Friends of Metro Parks along with the Metro Parks to encourage exploration of the Columbus and Franklin County Metro Parks district. Step 1: Get a passport! They can be found at the nature centers at Highbanks, Blacklick Woods, Blendon Woods, and Battelle Darby Creek. Step 2: Visit each location listed on the passport. There are three locations at each park! Step 3: After visiting, go and find a staff member to stamp your passport. They should be at each ranger station and nature center, as well as in park vehicles. Step 4: When your passport is complete, take it back to a nature center and turn in your passport. This will tell us how many t-shirts and swag bags to order or put together. Step 5: Join us at the Blacklick 70th anniversary party on October 20th to get your t-shirts or swag bags! We start off the program with a party, and we will end it with one too! In the meantime share photos using #MetroParksPassport on Instagram and tag @metroparkfriend to show off your adventures! Catch some photos of our Passport to Metro Parks kickoff event! For forty-five years, the Columbus and Franklin County Metro Parks have hosted the Winter Hike Series. Starting the first weekend in January until the end of February, thirteen parks open up their trails to folks starting their new year outside. Whether people are hiking for exercise, exploration, or just using the wonderful trails as a respite from the city, hundreds flock to the Metro Parks for the winter hike series, with the promise of a tasty cup of soup after. Each park features its own soup, and if you are an avid hiker working to fill out your hiking card, you really are missing out if you don’t try them all. This is my second year working through the Winter Hike Series, and I felt it was my duty to dive into each bowl of soup, unearth their history, and review them, although I am completely unqualified to do so. This blog post will cover all of the January winter hikes, with the next installment after the last winter hike. Blacklick Woods is the oldest Metro Park in our district, the first of the hikes in the Winter Hike Series and for the last two years, the coldest hike of the series. The promise of a warm bowl of soup to thaw the frost from your eyelashes and to heat your chilly fingers is enough to help get you through the first winter hike. One of the wonderful things about the Blacklick hike is that soup and hot chocolate are served inside the beech-maple lodge. Their soup of choice? Minestrone. The origins of this soup are unknown, but I was told that Blacklick has featured the same soup since the parks started serving food at the winter hikes. The soup is cooked the morning of the hike in huge turkey fryers. What is served inside is poured into crock pots, but what is served outside is still bubbling over the fryers flame. The broth is savory, with vegetables, beans and noodles floating around the bottom. What this soup lacks in substance, it makes up for with its herb-heavy broth. The best part is that it’s easy to slurp out of a bowl. Spoons are not necessarily required, which is good when you’re having trouble with fine motor skills due to frozen fingers. Pro Tip: Not enjoying how brothy the soup is? Throw some oyster crackers in there to thicken it up. What it boils down to: Easy to eat. Veggies, noodles, and broth. It was very warm, and I was very cold. This year, the Sharon Woods hike was met with a severe snow storm. It was difficult to get out to the park, but 488 people still came out to hike the trails and get a cup of Sharon Woods’ signature soup, White Chicken Chili. This recipe comes from Alli Shaw, a naturalist at Sharon Woods. She gave the recipe to her mother, who ended up winning a chili cook-off with it and suggested serving it at the winter hike in place of cinnamon rolls. Alli’s mother, Judy, who was a caterer, took the original recipe and changed it so that it could feed 600 people. The year before Judy passed away, Alli’s parents made the soup to serve at the winter hikes. Alli’s father continued to make the soup until 2016 and passed the ladle to Metro Parks staff member Jecy, and volunteer Ted. This year, we can thank Ted and his wife, as well as the all the other volunteers who chopped and sautéed onions, marinated and grilled chicken and baked goodies to pair with the soup! You guys, this is good soup! It was brothy and easy to slurp up if your hands were cold. It was salty and a little spicy, really flavorful, and had a lot of substance to it. There were big thick chunks of chicken in this chili that had been grilled by volunteers before putting it into the soup. I’m personally a big fan of spicy food, and the kick from this soup was perfect. They also provide some hot sauce to take the heat level up a notch for folks who live for spicy food, which makes this white chicken chili customizable, to a point. Pro Tip: Sharon woods volunteers make corn muffins to go with the White Chicken Chili. Sometimes these muffins are a little cold and freeze. Stick a muffin IN your chili, and stab it a few times with your spoon till it softens up. What it boils down to: Filling, flavorful, customizable. A little spicy! Prairie Oaks is the third hike in the series, and this year it was on a beautiful, bright, sunny day. According to Tom Cochran, the manager at Prairie Oaks, they make more and more soup every year to meet the demand of winter hikers. Their signature soup is Chicken & Noodles. This soup is truly a fan favorite. Everyone seems to rave about the famous chicken & noodles from Prairie Oaks. When the parks started to serve food at the winter hikes, there was a question over what would be the best soup to serve. That’s when a park technician named Dave Skinner mentioned a family recipe for chicken & noodles. After a taste test, they decided that this was the soup for them! The preparations for Chicken & Noodles start days in advance. Roasters full of the ingredients are stored in the fridge overnight. Before the hike, they fire up the roasters and let the chicken & noodles cook all day in order to reach the right consistency and to get everything to absorb. The result is thick, creamy, chunky chicken and thick, soft noodles. The perfect end to a chilly winter hike. The Chicken & Noodles are hearty and flavorful. To be honest, I didn’t get to try the Chicken & Noodles the day of the hike. The folks at Prairie Oaks actually said that they would make me a batch if I wanted to come out and try it, which is possibly one of the nicest things anyone has ever offered me. Truly, food is the way to my heart. However, I declined the offer in exchange for the recipe so I could make it myself. I’m pretty sure that it came out correctly because it was DELICIOUS and I now completely understand the hype. What it boils down to: Thick, chickeny, and noodley. A fan favorite! The winter hike at Scioto Audubon, for the last two years, has been greeted with beautiful weather. When I was in school, we studied the old impound lot and its transition from brownfield to beautiful, usable green space, so this park has a special place in my heart. While standing inside the Grange Insurance Audubon Center, I watched the cars file in, one after another, to hike in a park overlooking the skyline of our city. In the meantime, the smell of soup filled the air. Scioto Audubon actually features two soups, Chicken & Wild Rice and Vegetable with Beef Broth. According to assistant manager Chris Delgrosso, the Chicken and Wild Rice soup is “one of the finest soups you will find east of the Mississippi.” He might be right! This soup was really good. The soup was creamy, with chunks of chicken, carrots, onions and celery. It was well spiced, and thick, thanks to the wild rice that gave wonderful texture to every bite. This soup will stick to your ribs after a hike through the park, warm you up, and really keep you full. The other soup featured at Scioto Audubon is Vegetable with Beef Broth. It was salty, and warm. Something great to help thaw after the hike, but really does beg for a little something more. Luckily, Scioto Audubon provides oyster crackers to put in this soup, and it really makes this soup great! Pro Tip: They also had s’mores outside, which was wonderful since it was such a nice day! What it boils down to: The Chicken & Wild Rice is fantastic soup. It’s hearty, creamy, and filling. The Vegetable & Beef Broth soup is fine, as long as you stick some crackers in it to fill out the soup a little more. According to Metro Parks lore, Inniswood was the very first Metro Park that started the tradition of serving food during a winter hike. The original recipe was provided by the husband of Janet Whithers, who was a chef. After the winter hikes started getting more popular and there were more hikers coming to Inniswood, volunteers started to make the chili using his original recipe. Though I personally don’t know when this tradition started, it has been going strong for more than 20 years, and possibly right after Inniswood opened up for the first winter hike. Inniswood features beef, venison, and veggie chili. I was only able to taste the beef chili, but it was wonderful. This chili was warm and hearty with lots of peppers, beans, celery, and tomatoes interspersed with the ground beef. It was flavorful, but not spicy, which I can understand… not everyone has the same spice tolerance. The veggie chili, though I didn’t get to taste it, looked fantastic. There were lots of beans and veggies, and looked just as hearty as the beef or venison chili did. This soup is another favorite of winter hikers, and we can thank the Inniswood volunteers for all of the help preparing and serving soup, as well as making baked goods for all of the winter hikers. What it boils down to: Great chili, vegetarian options, and delicious cookies. Another fan favorite! Before the Winter Hike Series got really big, Clear Creek used to serve venison chilli at their winter hikes. For a while, they kept trying to make chilli but the crowd quickly became too large and the soup too expensive to make. So they switched to a delicious and cost-effective Ham & Bean soup. In years past, Marty Shull’s mother would make the Ham & Bean soup, but this year it was up to the park staff and volunteers to feed 800 people that came out to Clear Creek for the winter hike. I love this soup. It is just perfect simplicity. Ham base and great northern beans make up the soup, which fills the barn next to the park office with a smoky, salty smell and makes it a cozy little spot to relax and recharge after taking on the hills at Clear Creek. After getting a big spoonful of beans and broth, you can add chopped onions which give a nice satisfying crunch to the otherwise soft beans, adding texture and some of that oniony sweetness. They also offer corn muffins, which you can eat separate, or drown in the ham broth to thicken up the soup. Pro Tip: Drown the corn muffins in the broth and eat it with the soup after you’ve fished out the beans. What it boils down to: One of my personal favorite soups. Full of salt and carbs, it’s a great way to replenish yourself after the difficult trails at Clear Creek. Definitely worth the drive! Stay tuned for the next installment of Soup Review, which will be published after the last winter hike. Keep hiking, stay warm, and eat some soup! I'd like to take a moment to introduce myself, my name is Aryeh Alex and I'm the new President of the Friends of Metro Parks. Our Columbus and Franklin County Metro Parks are something very special to me, in fact they helped save my life. Several years ago, my doctor told me that my excessive weight and lack of physical activity was going to result in my life being significantly shortened. This eye-opening statement, to someone who thought they were invisible, was a wake up call—and I was determined to take action and get in shape. But it wasn't as easy I had hoped. Walking on a paved trail in Sharon Woods Metro Park was a real struggle, yet I persisted. My strength and energy increased with every step I took and I noticed something on my walks: nature. I had never really taken the time to see all of the beautiful tall trees, wild flowers, and animals that surround us and I wanted to see and learn more. I started exploring all of our Metro Parks in Central Ohio. I hiked around Big Darby Creek, scrambled up the hills of Clear Creek, and was chased by turkeys in Blendon Woods. I was feeling amazing and getting healthy. My love for these parks and the natural world that they showed me was cemented for life. They had quiet literally saved my life. Now, an avid hiker and volunteer naturalist with our Metro Parks, I wanted to give something back to the parks that have given so much to me. I joined the Friends of Metro Parks with the goal to ensure that our parks are around for generations to come and will always be a place for all Ohioans to explore. Our organization as grown from a dozen members to almost 1,000 individuals in just over a year. And now we have an opportunity to go to the next level and engage the 10 million annual visitors that visit our parks every year. We are re-launching the Friends of Metro Parks with the goal of having 30,000 members by the end of 2019 and to be the strongest advocates for the parks that we all love. To that end, we will be working to make a significant number of changes to better engage you, your friends, and Metro Parks lovers across the region. Starting off with the adoption of a new strategic action plan* at our first public board meeting, we will be kicking things off this June in a big way. I really look forward to meeting all of you and growing our ranks of Metro Parks friends over the coming year. I hope to see some of you at our board meeting in June or out on the trails in one of our amazing parks. Volunteer of the Year Greg Maney with Metro Parks Executive Director Tim Moloney and Friends' President Kathryn Kelly. I have been a volunteer for one year this summer! However, I’ve been climbing at the Scioto Audubon Park for about 3 and a half years. What are your general duties as a volunteer? What is your favorite thing to do at the Metro Parks? For me, these two questions go hand in hand. As one member of an extremely close but relatively small community; I help to keep the Scioto Audubon climbing wall in tip top shape. The wall was originally built by RockWerx, and it is constructed of molded fiberglass over a steel frame. As far as I know, the Scioto Audubon climbing wall is one of the largest, if not the largest, free-access artificial climbing wall in the United States. The attraction of this wall and its easy access draws climbers from all over Ohio, as well as from around the country. This wall has natural features as well as artificial plastic climbing holds. Over time, holds can become loose or potentially come out of their mountings altogether. This poses a potential risk for climber’s safety as well as the integrity of the wall surface. As a Wall Volunteer, I am part of the team that helps to identify weak spots on the wall, as well as help to keep the public safe and aware of the risks and requirements of this sport. Climbing is not without risk, but the thrills that comes with it is genuine and intoxicating. 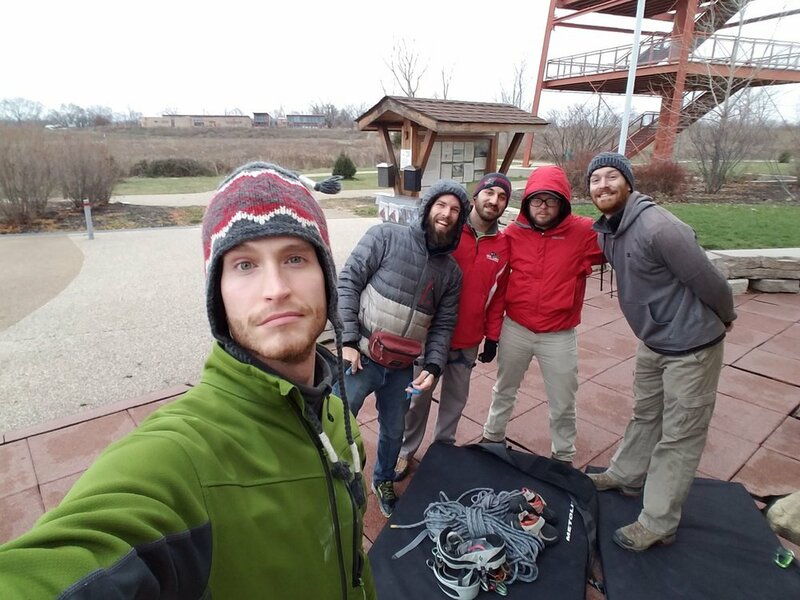 The climbing community in Columbus cherishes our wall at Scioto Audubon and routinely go above and beyond to care for it and make sure that it is used appropriately. As a Wall Volunteer at Scioto Audubon I have the privilege of being one of the team who sets new climbing routes and maintains existing ones. As with any sport, one is constantly seeking new challenges and greater excitement. After a while, the routes that exist on the climbing wall become routine, and we climbers begin to crave new adventures. I thoroughly enjoy setting routes at the climbing wall; it is a way to push myself further and to improve my own skills, and I have also discovered an incredible outlet for creativity. There is a very organic beauty to be found in the movements and the rhythms that are associated with climbing. Strength and agility and stamina all come together to allow one to perform a feat that is beyond the norm, and takes them beyond regular every day existence. In my opinion; having a vision for a series of moves and holds in your head, and then being able to create and actualize that dream is the most amazing catharsis. I don't know if I feel more joy than when I see someone attempt a route of mine at the wall and say afterwards that it was so much fun or that it was hard and makes them want to climb better themselves! The best thing about setting routes and being a Wall Volunteer is seeing how people from all walks of life and of any age, come together and join in a unique camaraderie in this shared love of rock climbing. What do you do when you aren’t volunteering at the Metro Parks? When I’m not climbing, I enjoy music and working with the youth group at my church. There are a couple climbers there also! My day job finds me at Grant Medical Center, where I am a surgical Nurse. I specialize in orthopedics and neurosurgery, I frequently scrub and assist surgeons while they operate. That’s essentially how I've become famous around the climbing wall. I’m never there without my trusty green scrub pants, they've become a bit of a trademark! One of my favorite experiences was the Inaugural “Rock On!” Community Climbing Festival. Between the food trucks, vendors, and community organizations present, I have never seen more life and vitality around the climbing wall. There were so many avid climbers in attendance, along with their families, it was difficult to even move around! The climbing community also warmly welcomed new climbers and folks who just happened to pass by and decided to give it a try. There was such an amazing sense of friendship and joy at the Climbing Festival, it is hard for me to see why anyone wouldn't want to be around it! The Ranger staff at Scioto Audubon have always been very welcoming and accommodating to the climbing community, and they truly outdid themselves with putting on the Climbing Festival. I can't wait for the Festival next year! What do the Metro Parks mean to you? The Metro Parks are an amazing resource for our city and our community, the Scioto Audubon climbing wall doubly so. As climbers, our greatest privilege is also our greatest challenge: Access. The entire climbing community in Columbus recognizes what a gem and a treasure that Scioto Audubon is, and they are quick to lavish praise on it. That the city and county would be willing to take such a risk and open up an attraction such as this is not lost on us, and at every opportunity we try to do our best to preserve and sustain it. The Scioto Audubon Metro Park is an oasis for me personally. It is only ten minutes from my work at Grant, and I can go down there at any time and enjoy a reprieve from stress and hustle and bustle. It offers one of the most unique and breathtaking views of the city as well. The Scioto Audubon Metro Park is a nexus; not only for myself and others in the climbing community, but also for many residents of Columbus and Franklin County overall. On any given day, there will be folks down at the wall or on the obstacle course from all walks of life and from all over the greater central Ohio area. There is nowhere else that such a diverse community could possibly come together like we do here. Why should other people become volunteers? To become part of something bigger than yourself, and to open yourself up to the opportunity to expand your horizons. Our time in this life is so precious, a fact that is sometimes painfully clear to me in my occupation. But the time that is spent among friends, or making new ones, and doing the things that make you happiest are perhaps the best way to spend it. Volunteering gives you the opportunity to step outside of your comfort zone, and to share your love of the world and the things in it with others. We are all in this together!